Last night and this afternoon, I was shocked when I opened my twitter feed to see that Cassandra Clare – author of The Mortal Instruments series and more – had been threatened via twitter. 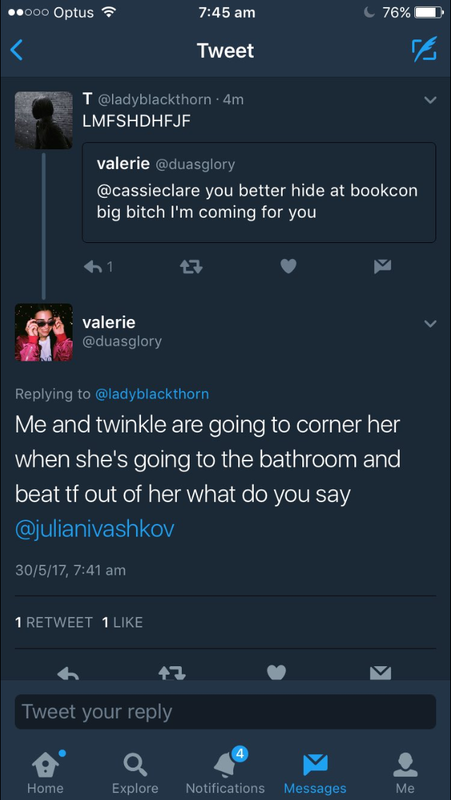 In all my time on social media, I have never seen an author so graphically threatened – or at all! Frankly it is shameful that a community that is supposed to be about sharing our love for reading and for these amazing people that devote time to writing is instead harassing and threatening them. Especially at an event dedicated to book lovers and fans. I wish I could tell you that this is an isolated case, but sadly, this is not true. 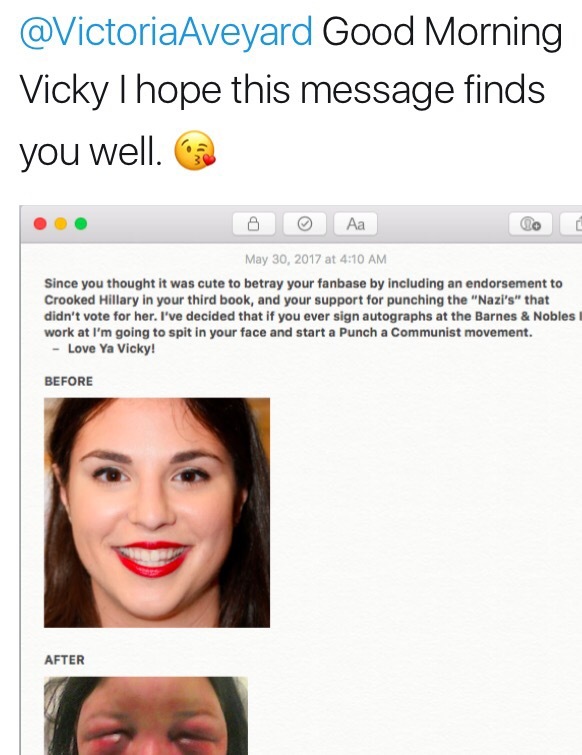 Victoria Aveyard – author of the Red Queen series – was also threatened via twitter. In this case it appears the tweet came from a fan who disagreed with some poliical views Aveyard had included in her book. The tweet included a picture of the author and another photo of someone injured, claiming this would happen to them. It is this absolutely disgusting behaviour that shocked and angered myself and many other fans. Lots of authors have come together to show their support for the authors at this time, send them your love too. It’s really very difficult in this full of activity life to listen news on Television, thus I only use internet for that purpose, and obtain the newest news.